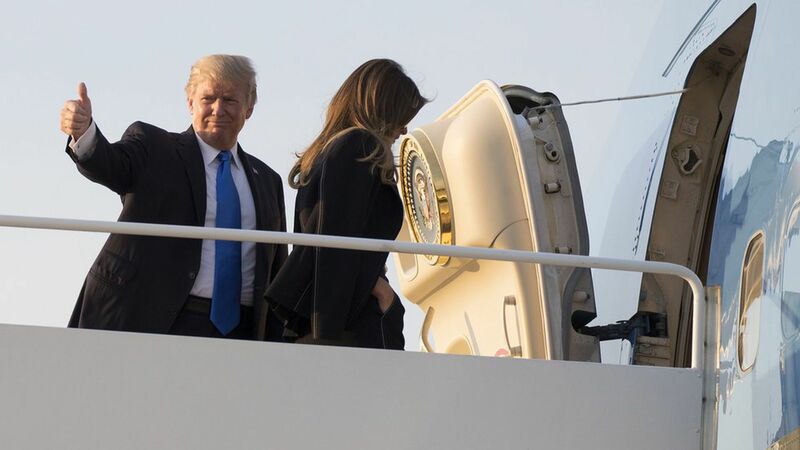 On board Air Force One en route to Paris last night, President Trump held an off the record gaggle with reporters, but he changed his mind this morning allowed his remarks — on everything from Russia to the border wall to China — to be released on the record. "I don't think this is the right time, but the answer is yes I would. Look, it's very easy for me to say absolutely, I won't. That's the easy thing for me to do, but that's the stupid thing to do…If you don't have dialogue, you have to be fools. Fools. It would be the easiest thing for me to say... I will never speak to him, and everybody would love me. But I have to do what's right." Did Russia hack the election? "I'm not saying it wasn't Russia. What I'm saying is that we have to protect ourselves no matter who it is. You know, China is very good at this. I hate to say it, North Korea is very good at this." Why not push Putin harder on election interference? "What do you do? End up in a fistfight with somebody?" The Russia investigation: "[T]he Democrats have played their card too hard on the Russia thing, because people aren't believing it. It's a witch hunt and they understand that. When they say 'treason' — you know what treason is? That's Julius and Ethel Rosenberg for giving the atomic bomb, okay?" Trump Jr.'s meeting: "If somebody called and said, hey — and you're a Democrat, and by the way, they have taken them — hey, I have really some information on Donald Trump. [sic] You're running against Donald Trump. Can I see you? I mean, how many people are not going to take the meeting?" Health care difficulties: "I'd say the only thing more difficult than peace between Israel and the Palestinians is health care. It's like this narrow road that's about a quarter of an inch wide. You get a couple here and you say, great, and then you find out you just lost four over here. Health care is tough." Getting China on board with North Korea: "But the biggest strength we have are these horrendous trade deals, like with China. That's our strength. But we're going to fix them. But in terms of North Korea, our strength is trade." Was a solar border wall a joke? "No, not joking, no. There is a chance that we can do a solar wall. We have major companies looking at that. Look, there's no better place for solar than the Mexico border — the southern border."